A good way to make songs more powerful and structurally sound is to use chord progressions not only within sections, but also across them. This creates a harmonic relationship between sections and adds to the sense of forward motion, tension and resolution, and overall strength. A change of section can feel more logical and expected, which you can also use to your advantage by doing something harmonically unexpected. First, we must define chord progression. Since there are two ways of placing chords side-by-side but only one term, “chord progression”, everyone calls both versions the same thing. Let’s call the second version, “chord succession”. In a chord succession, none of the chords have a relationship to the others except that first one and then another is played in succession. Playing E5, D5, and C5 ala Iron Maiden is a good example. Since nothing is going on, there’s nothing to define. It’s not even clear if this is E minor or C major. Chord progressions, by contrast, are so involved that books are written on them, so we’ll just cover the relevant basics. It is their nature to solidly define a key by concluding with V-I (the key’s fifth chord and first one). The chords of increasing tension precede the chord of no tension, which is therefore the ultimate resolution. 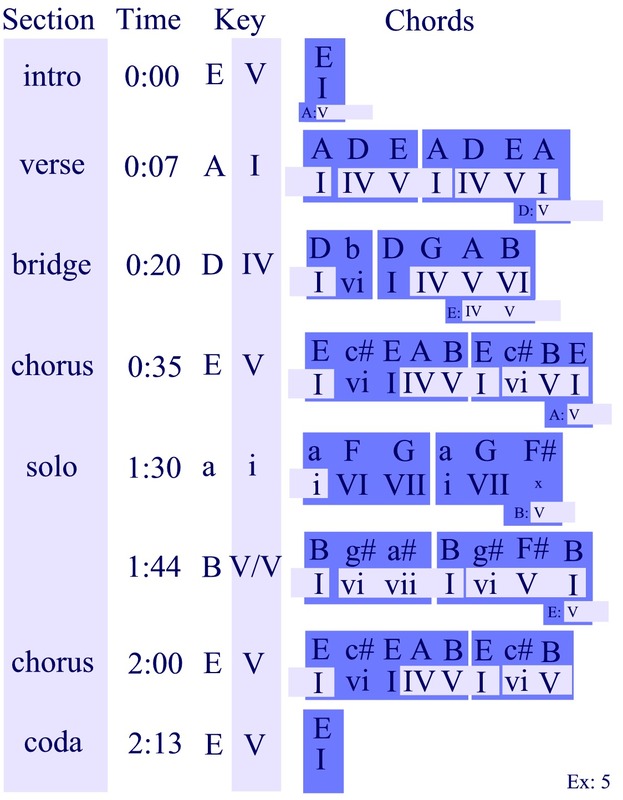 Several other chords can precede V-I, such as the famous IV-V-I (D, E, A). This defines the key as A major, provides tension and resolution, and moves (or progresses) the song forward purely by harmony. Let’s use the IV-V-I progression for structure. So what do I mean by structural chord progression? Let’s say your song has a verse, bridge, and chorus. We’ll decide our song, overall, is in A major despite any key changes within the song. To do a structural progression, we would write the verse in A major (I), the bridge in D major (IV), and the chorus in E major (V). After the chorus, we conclude the progression by returning to the verse in A major (I). See Example 1. In this example, the indication (V/IV) means “V of IV”, and that A major is not only I in A major, but also acts as the V chord in D major, our next key. Simply by concluding our verse on an A major chord and starting the bridge on a D major chord, we go V-I into D major. After the verse (I), we continue forward with the bridge (IV) and chorus (V) again (Example 2). At this point, we could either return to the verse music again, or go straight into a solo in A major, but that key is sort of expected at this point, isn’t it? Why don’t we do something unexpected, such as resolving to A minor (i) instead? It’s a nice surprise, a different tonality (being minor), and is also something we haven’t heard. The technique can continue within a solo. To determine what keys to use, decide what section (and key) will come after the solo, then work backwards. In our example, the E major chorus comes after the solo, so it makes sense to end the solo in B major. B is V of E and makes E sound like home. For this reason, at the coda in Example 3, we remain in E major instead of return to A major. By this point, E sounded like home anyway, and structural progressions have less strict requirements for completion. What if our song has an introduction? This could be in A major, too, but let’s use E major to create a build up to the main music. Notice how the chorus has a succession in the first phrase (I-vi-I-IV), but because I slipped in the V chord right at the end before returning to the I chord, this became a progression. To make structural progressions work, we must clearly define the key of each section. The only way is with a chord progression, for if I were to play all the white keys on a piano, the music could either be C major or A minor, or even modal. It must be definitive. This raises the problem of using progressions constantly when they are all very similar, which is why people avoid them in favor of successions. Still, it is possible to ignore progressions and then slip in the V-I or vii-I motion at the end of a phrase. Either that, or do it at the start of a section and then avoid it, such as the entrance to the solo. Since structural progressions are less strict, a song does not have to conclude with a finished progression, or even maintain them within a song. Two sections can be related by key when no others are. The song above ends in E major, the key of V, but still feels over. This approach can improve your songwriting and make you think of new paths for song development. The effect is often subtle, almost psychological, and yet helps retain a grip on your listener, something every composer wants. This technique and others can be heard throughout the songs on my album, The Firebard.